I've been on a blogging hiatus - maternity leave, if you will - but am hoping to pick up where I left off! On May 7th, our sweet Rosalie was born and life has been a beautiful, crazy whirlwind ever since. As I sit here, Max is playing with dinos and superheroes on the floor next to me, and Rosie is sleeping on my chest in her wrap, so we'll see how this experiment in blogging while parenting goes! I'd like to get the story of Rosie's birth down while it's still fresh - details are so hard to remember the deeper you get into parenthood. So here goes. Be warned, it's detailed! And long! You may want to take a shot every time I say the word "contraction!" I love birth and labor stories, but if that's not your cup of tea, I won't hold it against you for not reading this. It all started in the wee hours of the morning on Tuesday, May 7th, three days ahead of my guess date. I was in and out of sleep having mild contractions. They were not much stronger than all of the braxton hicks ("practice" contractions) I'd been having for weeks, so I just tried to sleep through them. Although I think in the back of my mind I knew these were the real deal. By morning, I was timing contractions 30 minutes apart, and sent Ben off to work thinking we'd probably have a baby before the end of the day, but not yet feeling a sense of urgency. I felt calm, ready, excited - I love the little butterflies you get during early labor, that feeling of anticipation in meeting your baby, the thrill of not knowing how it will all go down, and the sense of strength in knowing that I'm about to perform this miracle with my body, that I am the only one who can do it, and that I WILL do it one way or another! Keep in mind, this is early labor, when you're still full of energy! Max and I ate breakfast, with me leaning onto the kitchen counter every so often for a wave, and explaining to Max that my body was getting ready to push baby out. I told him Mormor (my mom) would come get him, that Daddy and Mary Anne (our midwife, who Max knows and loves) would help me push baby out, and then he would be able to come back home to meet baby. He seemed totally cool with the plan. When my mom arrived, the contractions slowed back down to 30 minutes apart. What?! I was busy packing Max's lunch and clothes, getting food for Bosco, and chatting with my mom about nursery decor (hey, I was excited!). I suppose my body realized that I wasn't focused enough for heavy labor and kindly slowed things down. Off went my mom with dog and toddler, and suddenly the house was quiet. To help move things along, we went walking around the neighborhood. It was a beautiful spring day, not too hot yet with a few clouds, so the sun was coming and going. I had to stop and hang onto Ben every time I had a contraction - I'm sure the neighbors were wondering about the new family on the block! We'd time a contraction 8 minutes apart, then 5, then 12, then I'd have what seemed like one immediately after the other. But often I could still walk while having these contractions, so Ben was convinced they couldn't be that serious yet. I had no idea what to think. We got back home and even though my contractions were still sporadic, I instinctively told Ben to call Mary Anne. I heard him trying to explain where we were in the process, and I could tell he was giving her the impression that we were not ready. So I got on the phone and told her that even though my contractions were all over the place, I felt like I might be getting close. I swear I started transitioning during that phone call. She told me she'd come to the house to check me out, and if I had a ways to go, she'd leave again (I like quiet and privacy during labor, and I think Mary Anne had figured that out about me). Thank goodness we called when we did, because things got real during that 20-minute wait for her to arrive! 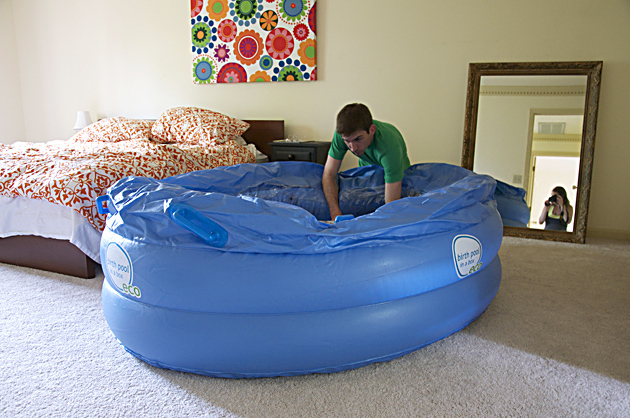 By this point, Ben and I had moved into our bedroom, where we'd planned for the birth to happen. I think it was around this time that Ben lit candles, and I turned on my birth music. I swear the ambiance and sense of comfort from all these familiar things is what pushed my labor into high gear. Things had gotten really intense by the time Mary Anne arrived. It was about 2pm, maybe a little later. Contractions were a few minutes apart, sometimes back-to-back, and she did a quick exam and declared that I was eight centimeters dilated. So basically in a matter of 20 minutes I'd gone from "this labor is taking forever," to, "holy cow this baby's coming NOW!" She called her assistant, Celesta, and our birth photographer, and told them to come ASAP. I had back labor with Max, so was expecting "regular" labor to be easier. It wasn't. Maybe because my active labor happened so fast with Rosie. The intensity was all in the front this time and I found the best way of getting through contractions was either leaning on the wall, or hanging my arms around Ben's neck and hanging my belly toward the floor. I've heard some people say they could labor without their husbands, but not me. I wouldn't let him more than six inches away from me, even when Mary Anne needed his help! Things progressed so quickly that she was forced to prep for birth solo. And man could that woman multi-task! 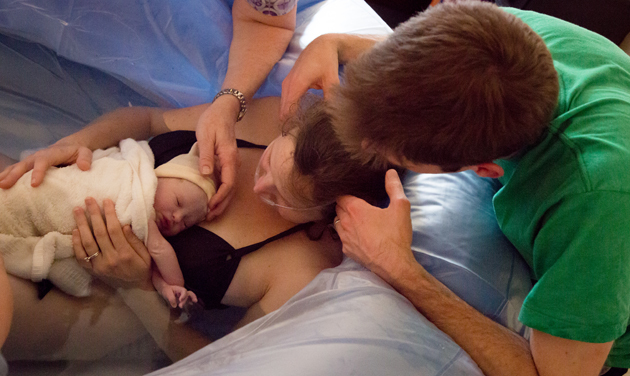 She was filling water into the birth tub, laying out medical equipment, texting status updates to our family, timing contractions, monitoring baby's heartbeat, and so much more, but I was too in the zone to be aware of most of it. I felt the urge to push not long after Mary Anne's arrival - more like I didn't think I could avoid pushing, and there was just barely enough water in the tub for me to climb in. I remember feeling so antsy to get into that nice warm bath. In the background, I heard Mary Anne say something along the lines of, "Ben, you may have to assist more than you ever wanted to," since it was still just her and Ben! I loved hanging over the side of the tub for the most intense contractions as I got ready for the pushing phase. 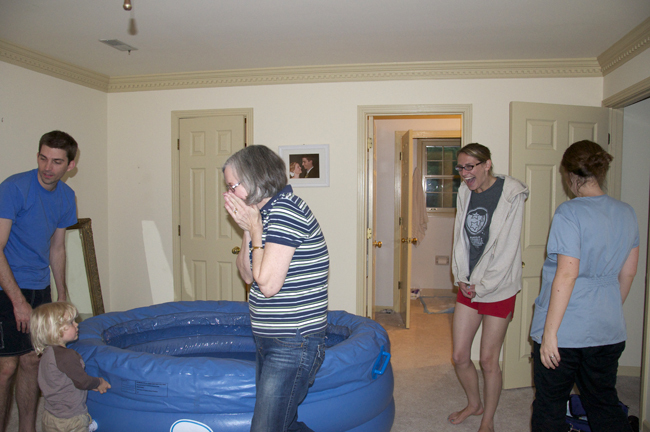 It was literally moments after I climbed in the water that Celesta and my birth photographer, Kalli, both arrived. Mary Anne had previously told me that I should hold off on really pushing until I couldn't stand it anymore. This helped stretch things out slowly so I could avoid the horrible "T" word ... tearing (her method worked, for anyone who was curious). At one point during a push, I was really wailing ("oh God, was my phrase of choice, apparently), and Mary Anne said, "God is already here, you don't have to shout for him." Ha! Nothing like comic relief to relax those pelvic muscles! Rosie crowned while I was still squatting and hanging my arms over the side of the tub (I found out later that Mary Anne and Celesta had floated a mirror on the water to see what was happening), and I decided to flip over to more of a seated position for my last hurrah. With Max I refused to look at him crowning with a mirror, or to feel his head as it was coming out, because it freaked me out too much. But this time I was less chicken and reached down to feel her tiny head. I was in awe when I flipped over and saw her part way out. It was surreal to be positioned in the water in such a way that I could watch every moment as she emerged into the world. I watched as her entire head came out (we were still in the water), and then we struggled a bit with the shoulders, but my capable team helped her shimmy out all the way. It was almost an out-of-body experience, until that moment when Celesta, who caught Rosie, helped me pull her up onto my chest. I could hear Ben getting choked up behind me as we reveled in our brand new baby girl. It was like time stopped as we first met her, held her, examined all of her little features. She was mellow and snuggly, looking into our eyes with such awareness about her. Honestly, I don't remember a lot of visual details from those first seconds and minutes, so much as I remember the sensations: her soft skin pressed against my stomach and chest, how delicate she felt, the relief of hearing her tiny cry, and the sense of elation and pure love radiating through my body and soul. It's true that giving birth is the greatest high you will ever have. 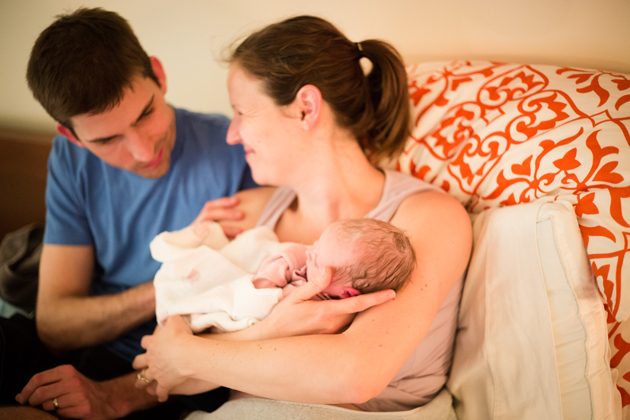 Birth photos are by the fabulous Kalli at Kalimana Photography, can't recommend her enough! I had pushed for 20 minutes in total and Rosie came out with maybe 3 or 4 pushes? Can't remember exactly but the whole thing was fast. Mary Anne later told me it could have been even faster if I'd pushed the first time I wanted to! 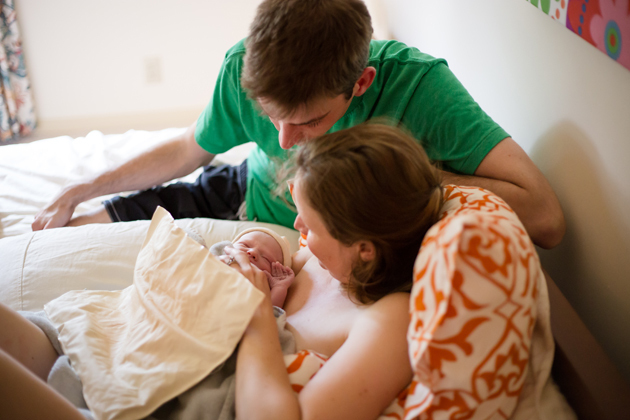 I moved from the water onto our bed to deliver the placenta, which happened about 15 minutes after she was born (almost long enough that they'd have had to give me oxytocin to get it out, but luckily it didn't come to that). It was utterly peaceful and beautiful, being in our own space with nobody prodding and probing us during those early minutes and hours of bonding. In my memory, the room was all golden and glowing with afternoon sunlight filtering through the window. Rosalie June was born at 4:15pm. Active labor had been less than two hours. I don't know how much time passed, really, I just know that once Rosie was with us, our birth team was gentle, quiet, soothing. They took care of baby AND mama, nurturing us and making it possible for Ben and I to soak up every minute. They checked all of Rosie's vitals while she was in our arms, and waited as long as possible to give her eye drops; they helped me nurse her, and when it came time to take her measurements, they did it all on the bed right next to me. They made me a healing herb mixture and had remedies ready when my after pains (ie, cramping that was almost worse than labor in my case), had me doubled over. They fed me Gatorade from a straw to re-hydrate, and Mary Anne warmed up stew and toast. We invited my family to bring Max home and come meet Rosie just a few hours after she was born. I was so excited to not be living thousands of miles away this time, so that we could share this moment with our families. I think Max felt really involved in the birth, which was awesome. He was the very first one to meet her, and wasn't sure what to think at first! Then came my parents and sister. I'm so thrilled Mary Anne was still around to capture these moments on camera. We hadn't told anybody it was a girl, so you can see the surprise and excitement on my mom and sister's faces when they spotted that pink onesie! So that is the tale of how Rosie joined our little family. My birth experience with Max was also wonderful - I'll have to share that one of these days, too. But for now I just count myself lucky to have had two such wonderful, uneventful, happy births, leading to two marvelous and healthy children!